First things first. If you're into blogs of the Catholic homeschooling variety, a friend of mine just started a blog called Catholic All Year. I often marvel at how this mother of six young ones always seems to have it all together. Can you say jog and rosary before 6:30am daily mass? Anyway, now she's blogging like a diva. She's got a Kids in Mass story that's totally worth the read. Some parenting book recommendations. Anyhow. Lots of relevant stuff over there...which maybe you're not that into because you're reading me...but seriously: go say hi. For instance right now he's sitting on my lap foiling all my attempts to keep his fingers off the keyboard, offering me sips of "hot tea" from a cup, and asking where all the babies went on the screen. At least the huz is available for periodic pep chats. 5 is for the 5 minutes I just bought myself by leading the little man over to empty out the recycling. All about the good habits around here. 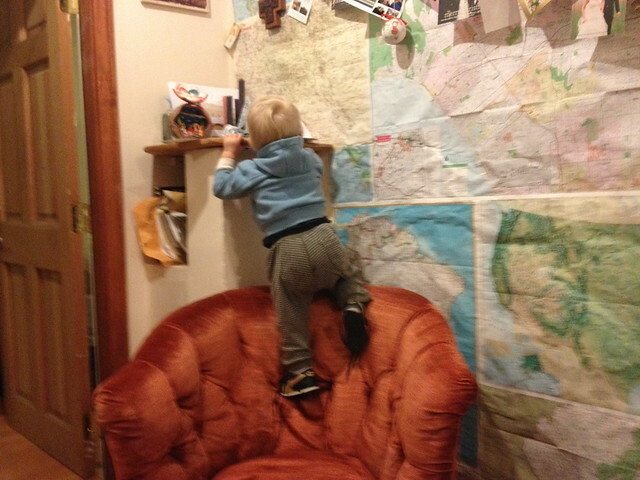 But alas that only lasted for two minutes, and now he's scaling the chair in the living room to access the shelf of Jake contraband on a quest for his Papa's iPad. So off I trot. I probably should've intervened before the situation reached the crisis that it did and I ended up with a back arching 30 odd pounds of tantrum on my hands, but instead I did what any self-respecting blogger would do. I documented it. Is it 6? Why, yes. I will have that glass of wine. But in all seriousness hailing back to #3: I feel like I'm productive at the expense of mothering. Or actually. The opposite of that. I feel like I mother at the expense of being productive. And I feel the expense keenly. Some days everything falls enchantedly into place, but those are just days when Jake takes three hour naps and then contentedly bangs his hammer on the floor while I hum about my business. I try to remind myself that getting down on the floor with some blocks to appease a fussy nineteen month old is not only doing "something," it's doing something wonderful, something good, something I will miss terribly in fifteen years. But instead I glance warily at the mess in my kitchen or make to do lists in my head or sneak peeks at blogs on my phone. So I'd love some thoughts from those of you who've "been there." Sorry to get all down on you. I was able to sit down and pound out the above paragraph because I plopped Jake into the tub. Now if he could spend all day in the tub, then my ducks would be in the nicest of neatest rows. Happy Friday to the Quick Takers and Jen who is in our little family's prayers. Six kids, jogs and prays the rosary before 6:30 AM daily Mass?! Okaaaay...well, I'm officially lazy. :-P In all seriousness, she sounds pretty inspirational. I'm still unmarried and childless so I'm not someone who's "been there" but I will offer my prayers instead! I do feel like the fact that they have each other actually makes is a little easier, but then there is the little baby who I can't give to the toddlers for them to care for (then again I've never considered this...) So yes, I am there with you and it is so hard sometimes!! In general though, once I let it go and just sit and read some winnie the pooh with them, I feel a heck of a lot more fulfilled than if I scrubbed the kitchen floor or exercised. I will definitely say a prayer for you!! Sometimes I'm blogging at the expense of being productive and at the expense of playing with Jordan, so that's really evil. You can feel better now. Also, I totally photograph things in the name of the blog before intervening, and sometimes that's a bad idea. I feel ya Kate. 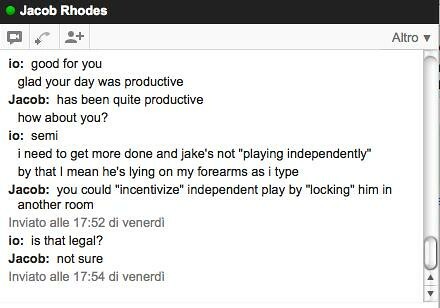 Sometimes Jordan is self-sufficient and I get stuff done, but then I'm kinda sad that she's self-sufficient and why doesn't she want to play with me anymore? Then sometimes she's uber cling and I get frustrated...is this part of the job or am I just a crazy? Hmm, I have never been in the situation of having 1 19-month-old. Why? Because by the time my oldest was 17 months, I had another! This did present some challenges to "getting stuff done" for a while, but after a year, they kept each other occupied. Voila! There goes the bored toddler problem and also most of the guilt about not playing with the kids. As I type, 3 of them are busily playing Pokemon/Mario toys and the baby is interested enough in trying to harass them that he mostly leaves me alone. Basically, your baby is so amazingly cute I feel the need to browbeat you into producing some more like him. Hey! Why didn't I know about this? That's how new I am to blogs, I still don't know who's in the club. Thanks so much for your kind words and for sending some of your good folks my way. As for #7, others have offered concrete solutions, but I want to offer something less concrete. Remember that mothering and fathering are very different animals. I would watch Jim come home from a long day of whatever he does all day and get down on the floor and play blocks or have a tickle fight. And I would realize, hey I've been with this baby all day and I never really played anything with him. And I would feel guilty, but I would still persevere in trying to accomplish things over and around my baby, just still feeling guilty. But then I realized the difference. Fathering is about quality. Short intense bursts of awesome. Mothering is about quantity. A near-constant, comforting presence. I think toddlers are good with that. So, if you want my opinion, just keep ignoring him to the best of your ability. And keep loving him. And you'll both be fine. 2. Secondly, sanity is highly over-rated.